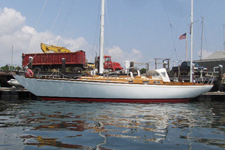 Salamina is a custom Alden 45 built by Paul Luke in 1984. 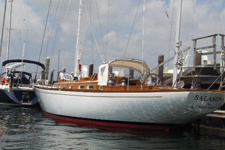 Until 2005 she was owned by George Denny & named Restive. 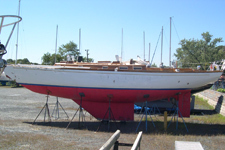 In 2006, she was sold to Craig Shelton of New Jersey. 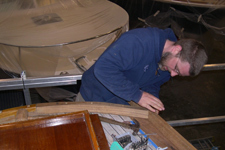 Craig had spent years looking for a boat which was perfect for him - being incredibly strong and seaworthy as well as beautiful. 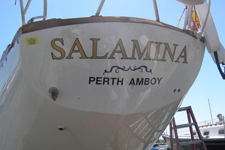 In early summer 2006, he took Salamina from Padanaram to Perth Amboy, New Jersey. 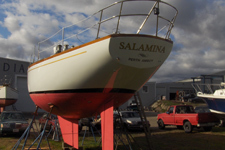 In early fall, Salamina broke her mooring in Tropical Storm Ernesto, and spent some time up against a train bridge. 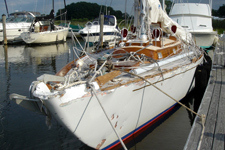 The New Jersey surveyors and boatyards told Craig she was totaled (more than 80% of insured value to repair). 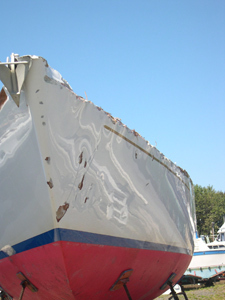 Craig called Stuart, and Stuart & Brodie drove down to Perth Amboy to see the damage. 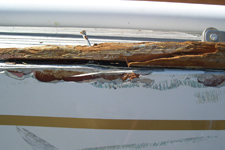 After assessing damage, and estimating repair, we thought we could do the repair just within the number. We trucked her up to Padanaram. The damage was impressive. 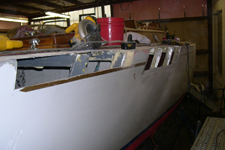 If she had been wooden or fiberglass, she would have been in splinters. 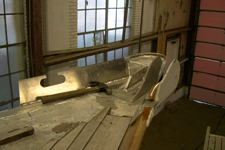 To get to the aluminum work, much of the interior came out. 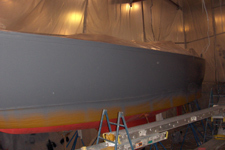 Aluminum work was done with Ocean Marine Fabricating. 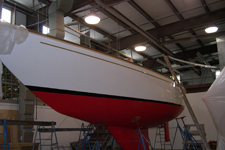 Fabricating was extensive at the bow and port side sheer/rail. 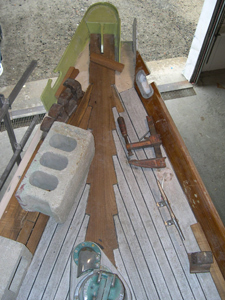 The covering board and toe rail as well as deck to the king plank were replaced as well as the taff rail. 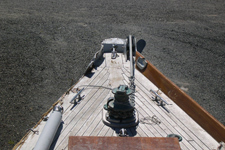 Both the bow rail, stern rail & all stanchions on the port side were replaced. Running lights and wiring was replaced. 6 port side chainplates were replaced. 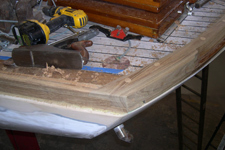 The port side had to be completely refaired and Awl-gripped. 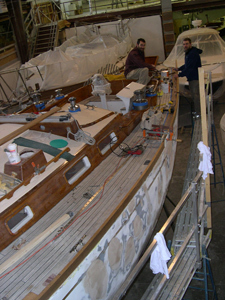 A new rig was ordered and assembled with all new standing rigging and furling system. 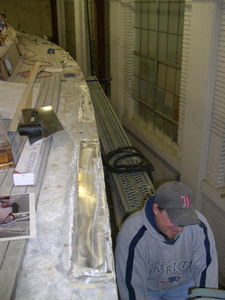 The jib track was also replaced, and the jib itself was replaced. 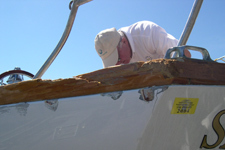 Lifelines were replaced as was all damaged running rigging. 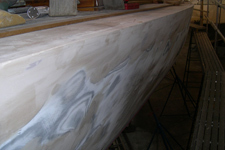 We feel that the project was a complete success. 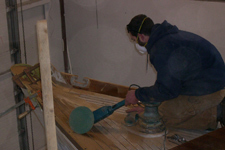 We were able to get the job done right at the 80% insured value. 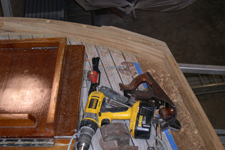 Structurally she is as strong as ever, and we have replicated all of the wonderful detail in the woodwork that Luke started with. Craig is able to keep the boat he loves.